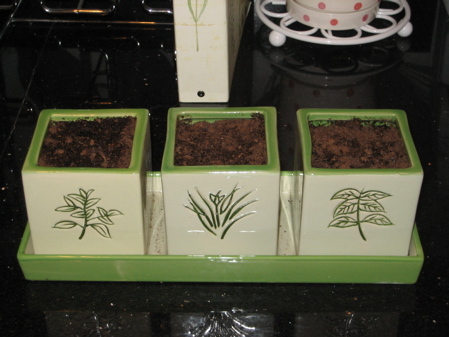 For Christmas I bought my mother an adorable window gardening kit from Red Envelope. In fact, I thought it was too cute to pass up so I ended up purchasing one for my own use as well. Last Monday I finally got my act together enough to plant the seeds and as you can see below I’m pretty excited about their progress. 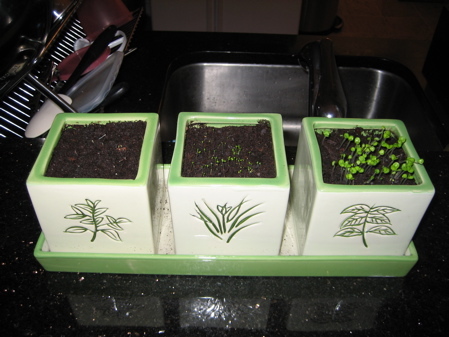 Unfortunately I wasn’t paying attention and I planted the Chives in the Oregano pot and the Oregano in the Chives pot. Oh well. At least the Basil is correct. After they get a little more hearty I’ll transfer them to my window box so I can hopefully grow a gigantic “forest” of fresh herbs all summer long. What a pretty way to grow cooking herbs! I really like chives on baked potato and finding fresh basil in our local grocery store is difficult. I’ll have to add cooking herbs to our starter garden. I hope luck in the yard is as bountiful as your meals look delicious! I’m going to try blogging some of the meals I cook from our harvest.